Lighting A Revolution: Ink Blotter 116, "The Edison GEM Lamp"
Blotter number 116; image number: LAR_B116. 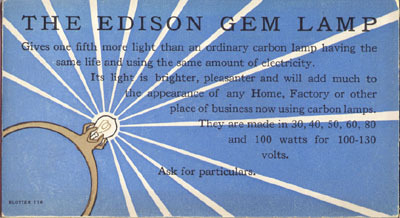 "The Edison GEM Lamp. Gives one fifth more light than an ordinary carbon lamp having the same life and using the same amount of electricity. Its light is brighter, pleasanter and will add much to the appearance of any Home, Factory or other place of business now using carbon lamps. They are made in 30, 40, 50, 60, 80, and 100 watts for 100-130 volts. Ask for particulars." GEM stood for General Electric Metallized, a type of carbon lamp introduced in 1904 and designed for greater energy efficiency than older carbon lamps. High energy costs in Europe spurred development there of an array of lamp designs intended to exceed the common carbon lamp's average of 3.2 lumens per watt (lpw). Trade agreements and lower energy prices gave less incentive to American producers to follow suit. But pressure to offer a more efficient lamp began to mount after Carl Auer von Welsbach's 1898 invention of a metal-filament (osmium) lamp which gave 5.5 lpw. GE's Willis Whitney answered by baking a standard cellulose filament at high temperature using the newly invented electric-resistance furnace. This gave the filament metal-like properties (hence "metallized"). The resulting lamp operated at 4 lpw and became the most efficient carbon lamp ever made. The company designed the GEM lamp to make the most of their existing production facilitiesthe new lamp appeared almost identical to the regular carbon lamp it was intended to replace. So GE focused their advertising effort on the higher efficiency, and soon regretted the decision. Consumers became confused when GE and others began marketing even more efficient tantalum and tungsten lamps just a few years later, forcing the company to revamp their advertising by creating the Mazda trade-name. However, many consumers continued to buy "efficient" GEM lamps, which were cheaper than metal filament lamps. Only during World War One could lamp makers finally stop mass-production of GEM lampsin the name of materials rationingwithout upsetting consumers. The range of wattages available (in all lamp types) was also "rationalized" during the war, resulting in today's common ratings of 40, 60, 75 and 100 watts. Even today the GEM lamp creates confusion, though now among lamp collectors. 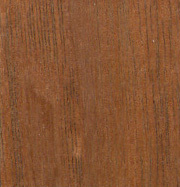 It is very difficult to distinguish GEM lamps from the regular carbon lamps that many manufacturers continued to produce.